One of the most remarkable features of the United Methodist “Call to Action” report is its requirement for suspending the rules. Rule suspension is not described as a regrettable but necessary option, but as a “key responsibility.” While it is mentioned specifically only once, the surrounding verbiage clearly places rule suspension as the unspoken background of much of the CTA/Apex report. Note the broad, undefined circumstances and purposes for rule suspension. Any of the following rationales may be invoked by the church’s “courageous, collaborative leaders” to justify their key responsibility for rule suspension. The 2012 UMC General Conference will vote on legislation to give the new “General Church executive function” authority to bypass, ignore, and suspend the rules put in place by the General and Annual Conferences. Since rule suspension is “a key responsibility of leaders,” a Bishop, District Superintendent, pastor. or any other functionary can and, according to the Doctrine of Accountability, will be held accountable if they fail to implement any policy or achieve any target goal established by their “courageous, collaborative leaders,” despite any misplaced regard for the Book of Discipline or the Book of Resolutions. Until the Call to Action is fully implemented, courageous and collaborative leaders are called upon to make changes toward measureable and quantifiable priorities that do not require legislative action. In other words, too much democratic discussion and voting interfere with efficiency. The discussion of the “Church’s overall mission effectiveness, connectional spirit and affordability, but also its relevancy” is fraught with political implications. Suffice it to say that the Call to Action will, if implemented, allow its crafters to wield Alexander’s imperial sword with no input from the Phrygians. It is no accident that the proposed rule suspension has many possible justifications. In the event of the “double dip recession” economists fear, speedy action may indeed be necessary. Reasons for church closures, clergy and staff layoffs, and agency eliminations will need to be flexible enough to sell to a variety of constituencies. It is essential to remember, however, that the financial crisis we may face is only the “opportunity,” or excuse, to change the “mission/values/culture” of the United Methodist Church (p 149) by means of executive fiat instead of the democratic “rigamarole” referred to so dismissively by Bishop Palmer. Any time rules are discussed, rule suspension is in the background. Any time leadership is discussed, rule suspension is in the background. Any time structure is mentioned, rule suspension is crouching at the door. Any time accountability is extolled, rule suspension is lurking. Any time distance or relevancy is mentioned (code words focused on “liberalism”), rule suspension is in the background. Any time sustainability, affordability, or viability are mentioned, rule suspension is imminent. Because the justifications for rule suspension are so deliberately broad and vague, the scope for unilateral executive decision-making is vast. It could conceivably range from a pastor’s circumvention of the Board of Trustees, the decision of a D.S. to close a well-propertied church, a Bishop’s arbitrary refusal to allow certain motions to reach the floor at conference, to the COB’s cancellation of a seminary’s affiliation with the UMC. What? Impossible? Against the rules? Let’s make this easy. What would your superiors like to see happen? What are you unable to do right now because rules are in the way? 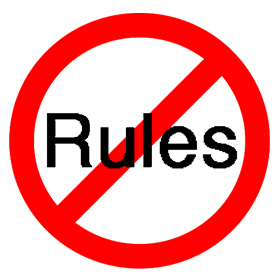 What would you be able to do if it weren’t for the rules? Or, what would other people do to you if it weren’t for the rules? And the Call to Action cites the UMC’s lack of trust as a problem (pp 7, 11, 25). This entry was posted in Call to Action, United Methodism and tagged Bishop Palmer, CTA, DS, rule suspension, UMC. Bookmark the permalink. I am really confounded by a proposal that assumes giving the Bishops more power and authority will somehow create revival. What organization in the world is moving to a “top-down” system rather than away from it?